This society preaches abstinence to its youth and then hands them car keys at the age of 16. Add a parental divorce to this already delicate equation and maybe some academic pressure or general family dysfunction or a genetic disposition toward mental illness and a kid will begin to crack like the foundation of a mid-80s split-level ranch, from the guilt and frustration. Some kids will relieve this pressure through athletics or activities while some turn to vandalism and petty theft. Others will drive like hell and get scraped off the pavement and have their dirty laundry aired as an example to other depressed/anxious youth. By far the noblest and most altruistic therapy for teen angst is the garage/basement band. The genre is not necessarily important as long the music is loved by some and hated by many. Without the sanctuary of post-glam pre-grunge progressive rock, any of the members of Youth In Asia could have ended up dead, fathers, in jail, or in a decent college. On the last Friday of 1991 Brad Bush, Rich Reece, and Marc Reynolds gathered in Reece’s basement to cover Doors songs. The gear was already there: Marc played the Farfisa organ which was missing the top cover so its analog innards were inches from his hands. Brad sang through an early 50s generic “Bassamp” with a wooden cabinet using a high-impedance mic from Radio Shack, a rig that inspired Rich to enforce a policy of rubber-soled shoes in the basement. Rich played a drum kit that his grandfather began assembling in Iowa in 1943, complete with real cowbells from a feed store. The high school freshmen launched into “Soul Kitchen” and proceeded to spend the next year or so reassuring each other that they weren’t just killing time. Bassist Jason Hodam would occasionally sit in as would guitarists Darren Jahn or Jon Wood. None of these players would quite fit the equation or possess the patience for the egos of Brad, Marc, and Rich. In May of 1991, Rich and Marc came up with the name “Youth In Asia” in a History class and borrowed a Rhodes piano from the choir for the summer. In the fall of 1991 all three members of Youth In Asia were both Nazi soldiers and ballroom dancers in Sprague High School’s production of “The Sound of Music”.In the spring of 1992 Youth In Asia was joined by Mani Mokalla on guitar to play a couple of Them songs at a sock-hop fundraiser for death with dignity. Marc was the only member of Youth In Asia in their high school’s choir and it was there that he met Nate Anderson. On the afternoon of March 11, 1992 (Nate’s 17th birthday) Marc dragged Rich into a practice room within the choir department to meet this guitarist. Nate had with him R. Scott Bauer who also played guitar. Nate and Scotty, as they were called, were Keizer natives who had shunned the world of sports to spend their afternoons in the woodshed. Nate moved to Salem when he was a freshman and Scotty joined him for one term at Sprague before returning to Keizer. On this particular afternoon they ran through “Little Wing” with Rich and Marc and then auditioned it for the Oly Follies, their high school talent show. Brad was not excluded, they just didn’t have the time to polish the song with vocals. In the same show Marc, Nate, and Rich accompanied vocalist Sophia Baez on “Never Loved a Man” and Mani Mokalla on “Imagine.” A few weeks later Marc, Nate, Rich, and Scotty put together a reggae cover of “Puff the Magic Dragon” for a spring pep rally for baseball. In the September of 1991 Rich quit marching band. He’d made the acquaintance of percussionist Joe Talik who could already play drums, guitar, and piano and was beginning to learn bass. As the line-up neared completion with Nate and Scotty, Rich thought to bring in Joe for an audition and he fit nearly perfectly. Since it was 1992, Joe’s playing reflected influence from Flea and Les Claypool and since it was high school in Salem Joe also listened to an unhealthy amount of Rush. He and Rich were able to communicate in such a way that the foundation was covered and their time seemed good. Joe also knew enough theory that he could keep up with Marc, Nate and Scott. The stage was set for them to begin writing a series of songs the 6 of them had been individually sitting on for years. There is then a break into a fast, straight, up-tempo guitar solo by Nate where he leads them back to the head. The lyrics are about Gary Burford, a marginally infamous blues circuit player in the North Willamette Valley. The Ballad of Burf is seven minutes long. On Liberty Road in South Salem there is an independent convenience store that, in 1992, carried the RC line of soda products in their fountain. This particular store had, according to Nate, Brad, and Scotty, a nearly perfect blend of syrup and carbonated water for their Root Beer. So they wrote a song about it. Joe Talik opens with a blistering pop-slap bass line that the rest join in within a few bars. There are a few verses about how great the soda tastes and how it becomes addictive as quickly as we were hearing about crack from Bush Senior. As with all Youth In Asia songs, “Carbonated Smack” has multiple breaks and tempo changes and a whole lot of guitar. Tragedy stuck Youth In Asia in the fall of 1992 as Marc began to miss rehearsals due to football practice. Since all Youth In Asia members are native Oregonians they are naturally as passive-aggressive as “Office Space” boss Bill Lumbergh. So instead of discussing their concerns with Marc, they wrote a song about football. Most of “Football” is really fast and it has a half-tempo turn-around between verses. Every 4 bars the song is totally paused for an arbitrarily-timed break. The lyrics are about high school football: “Take me to the 50-yard line. The popcorn’s hot and the girls are so fine.” Football would sadly lead to Marc’s departure from the group so he could focus on his jazz studies which would land him a full-ride at a Midwestern university. “Puff the Magic Dragon” was played a baseball pep rally in 1992. “Sympathy for the Devil” was played in the style of the Jane’s Addiction cover nearly every time Youth In Asia performed. They occasionally played “Alison” by the Pixies and “Dumb” by Nirvana. Stevie Wonder’s “Higher Ground” was played in the spirit of the Red Hot Chili Peppers and they would add a verse of the Doors’ “Roadhouse Blues” in the middle since they were both shuffles. Flannel Fest was scheduled for a Saturday in 1993 on the patio at Rich’s parents’ house. Youth In Asia was hardly a grunge band but since it was 1993 and they wanted at least a few people to show up and watch they knew it had be contemporarily themed. They invited fellow middle-class rockers Havoc Cow and The Roasters to play and the day was a huge success. Sadly, they would be moved inside after the Salem police showed up from complaints about the noise. In the fall of 1993, Nate and Scotty moved to Gresham to attend Mount Hood Community College and the remaining members would drift into other projects. 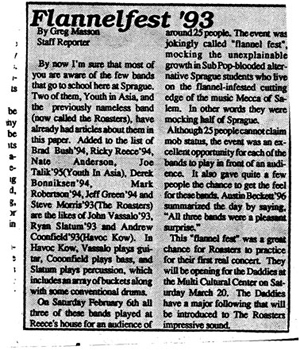 By 1995, Rich discovered a ska band named “Youth In Asia” and he remembered advice from EZ Eddy back in 1992. “Young Rick, that is the best band name I have ever heard. You need to copyright it immediately because someone else will come up with it.” Rich, of course, did not copyright the name so the band would later go by All Beef Patty when they needed a name. We also had a slightly raucous blues number that Nate dubbed "Ross Perot," stemming from the fact that the only lyrics I repeatedly used for it were "I made this money, you didn't, right Ted? We outta here," which I had proudly lifted from "My Prerogative," a Bobby Brown song that had been popular a few years earlier. And, it should be noted that, as you can see in these photos, Rich was the proud owner of an ironic mullet in 1992. I would challenge anyone to find documented proof of an ironic mullet that pre-dates this one. YIA's only piece of indie cred, and we had to wait a decade for it.